Happy Halloween! These were just so cute, I couldn't resist making them! When Brad brought over a 3 year old neighbor to visit, I knew I made the right decision to make them. He loved them! You are supposed to put dots of mustard for the eyes...but, I don't like mustard. So, thanks to Rhodes for another fun idea! Make one dinner roll recipe. Divide dough into 24 pieces. I reserved 6 pieces for bread sticks and 6 for cinnamon bite rolls. Take each piece and cut in half. Roll each half into a 2 foot skinny rope. Cut off 1 1/2" and reserve for the top of the "head." 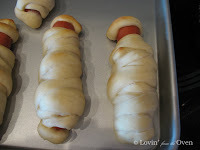 Starting at the bottom of a hot dog (I wiped the dog with a paper towel; works easier if the hot dog is not wet), wrap the skinny rope around once and pinch the end to seal. Continue wrapping up toward the head, about 4 1/2". Seal off end. Use other skinny rope, going the other direction; seal off ends. Use reserved piece to fashion a turban or halo on top of head. I need to make these! I'll hear, "Mmm, mmm, good, Mom!" That sounds fun to do! Greg and I are definitely going to try it sometime!